October 24, 2016 September 26, 2016 / Julie Brook, Esq. Y our opening statement is an opportunity to be creative and show your personal style. But as defense counsel, there are points you’ll always want to make; using an outline will help you to stay focused and organized. Defense counsel’s overall goal in the opening statement is to deliver the defense perspective in storybook fashion, letting the jury know exactly where to find the weak points of plaintiff’s case. A. Introduce defendant and provide a brief background statement. 1. Explain how a complaint can be filed in court by merely paying the legal filing fee. 2. State that the complaint contains mere allegations that plaintiff must establish by a preponderance of the evidence. 1. Stress that jurors must not to be swayed by sympathy or passion. 2. Urge jurors to use common sense in listening to the evidence and in applying the evidence to the law given by the judge. 3. 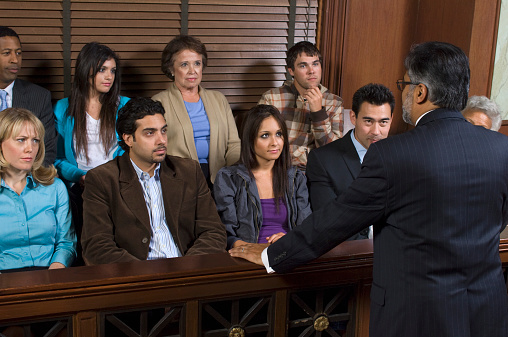 Remind jurors to keep an open mind until they’ve heard all the evidence. A. Discuss facts that show that plaintiff can’t produce facts that will be enough to satisfy the burden of proof on a necessary element of plaintiff’s case. B. Explain any affirmative defenses or mitigating circumstances, and discuss facts appropriate to their presentation. Discuss the disadvantage of being second and not having the last word. Secure agreement of the jurors to keep an open mind, use good common sense, and hold plaintiff to the responsibility to establish its burden of proof consistent with each element required to establish legal liability. For sample defense opening statements along with much more practical advice, turn to CEB’s Persuasive Opening Statements and Closing Arguments, chaps 2 and 5. ← Should You Be Using Client Intake Forms? Another great post. When you can find a great one-sentence theme for the case and keep using it to tie all the facts together, that’s gold.